Caldera Spas hot tub distributor Certikin International and Calorex will be marking a 40th anniversary at SPATEX with a special event day when the 2019 outing of the wet leisure showcase commences next week in Coventry. You may not remember all the major events of 1979 or even have been born then, but it was the year that Certikin established a business partnership to become the UK distributor of Calorex swimming pool products, and 40 years later they are still going strong. The names may have changed along the way, from Calorex Heat Pumps Ltd to Dantherm Ltd and Peter Geekie Pools to Certikin International Ltd, but the duo are still continuing to grow and are very proud to still be in the pool business together and a major presence in the wet leisure market. Certikin; which is once again promoting a wide range of products along with the WhatSpa? Best Buy Award-winning Caldera Spas options that include the seven-seater Niagra hot tub from the stunning newly-enhanced Utopia Series to current and prospective dealers, along with the Fantasy Spas hot tub range from Watkins Wellness; and Calorex will be celebrating the magnificent four decades milestone next Tuesday, January 29, during the first afternoon of SPATEX with a special event for clients and customers on their joint Stand C14. During a long run of successive SPATEX appearances at the Ricoh Arena in Coventry, both Certikin and Calorex have booked imposing stand presences to promote new products and a wide range of state-of-the-art technology that is backed up by a large team of professionals to provide customers with top quality product knowledge and after sales services. With the joint sales and technical teams offering a combined 150 years of experience, the Certikin and Dantherm Group combination has been proclaimed as being able to offer ‘unrivalled knowledge and support’ from initial enquiry through to product specification, installation and follow-up routine servicing. For this edition of SPATEX, Calorex will be displaying a range of swimming pool heat pumps and AHUs, while putting the spotlight on the advanced technology of the Dantherm dehumidifier and heat pump. Dantherm’s latest heat pump, the HPP, which includes key design features such as a reverse cycle defrost and titanium heat exchanger, will be showcased on the stand throughout the three days of SPATEX and is being promoted as an ideal product for the domestic pool market. Not only does it contain the latest cutting-edge technology but it also represents excellent value-for-money and is environmentally friendly. All of Dantherm’s stylish CDP dehumidifiers, predominantly designed for indoor and therapy pools, are energy-efficient, low sounding units that provide the best in humidity control and are developed with a focus to quality, functionality and energy saving. 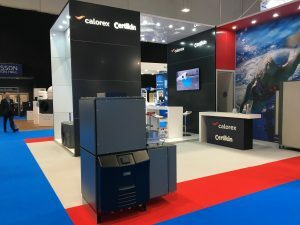 Calorex’s modular Variheat is also being rolled out as a key product on display, complete with a PLC control system interface, as well as our AA 500 high capacity ducted dehumidifier and a Pro-Pac heat pump. To find out about more about the Caldera Spas and Fantasy Spas ranges and opportunities for becoming a dealer for the respective brands from Watkins Wellness visit the Certikin stand during SPATEX at the Ricoh Arena, from January 29 to 31, or call Certikin directly on 01993 778855.